New! Predation Enterprises, the world-reviled folksy firm that brings you instant Twitter followers, now presents Kirkiss, the only automated Amazon book review service on Earth! Attract legitimate New York literary agents and legacy publishing houses with Kirkiss's amazing Amazon review package for your books! Starting at a lousy twenty-five bucks per book! That's right, the same twenty-five that get you ten thousand cosmetic followers on Twitter before your credit card purchase has finished clearing! But we don't do book reviews instantly! No! No! Nonononono! That would be stupid! We spread the five-star heartfelt Amazon reviews on your book over a three-week period, so they seem genuine! For an extra five bucks we'll spread a maximum of three four-star reviews in the mix to ensure an appearance of authenticity! And for another five, why, we'll give your book a one-star pan in a country-hick dialect! Our customers swear by the one-star pans, insisting that within minutes of a review slamming their book as the "wors dang thang ever" going live they sell more books than with a dozen of our five- and four-star zingers alone! Psychologists call it reverse psychology! Now just for you, for responding to this amazing introductory offer, we'll send you the entire package for the low low low price of thirty-three buckaroos (plus $36 shipping and handling)! And: Kirkiss will toss in a free set of genuine Ginsu knives! The zingers? Kirkiss uses nothing but the most durable, time-tested persuasive adjectives, including the never-unpopular "page turner", "masterful", "compelling" and "eminently memorable"! Exclamation marks on every sentence guaranteed or quadruple your money back!!!! Our cutting edge technology is built around the Damnable Snoflake Spammifier IV, which randomly provides a different untraceable ISP with every Amazon contact! And: The Spammifier IV's exclusive NSA-certified hack feature assures a "verified purchase" tag with every—count 'em—every review! Click on the link below and Kirkiss will deluge you with a twenty-four/seven hourly sampling of our reviews for the next two months at no cost! Hurry, while supplies last! Taking a little break from Bacon's Blood. This came as a perverse inspiration, and yet...I'm surprised nobody's tried it. *, Mathew. Hilarious. Such an inventive, tongue-in-cheek – or maybe not – story. Going after Kirkus, Amazon and those $19.99 TV come ons all in just one story. I love it. Not today, David! I've got to finish rewriting First Shot! Glad you like this! Order now, Kathy! We'll drop the S&H charges just this once, JUST FOR YOU!! Hilarious in part because it's so close to the truth, and son, we can't handle the truth. JLD, I injured my finger and broke my keypad trying to open it. Surprised it isn't here yet, Gary--or maybe it's been here all along. They just haven't marketed it aggressively enuf. I know, Amanda. We could be with Knopf or Random House by now. Or at least represented by Andrew Wylie. Gary, was it Satan who said "the truth shall set you free"? Hotter than Billy, Jen? Mein Gott! Budget's a tad tight right now, John. We blew our SBMA funds on the contract with Billy. Oops, too many letters in the acronym for Small Business Administration. "Psychologist call it reverse psychology." This made me laugh incredibly hard. I think I needed that this week. And then the comments and Jen's story are almost just as great. Jen, you need to write a story now just to post the picture. I agree. 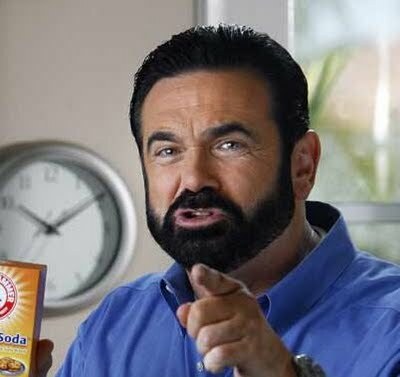 We can have an election as to who's hotter--Billy Mays or Jen's hubby. Love it. Funny and realistic, maybe too realistic at the same time. "*"
Spot on. I've always wondered how this is seemingly done on Amazon so often. But among the timeless adjectives you've not referred to yet I'd feature the completely meaningless 'thought-provoking', the uncontextually used 'evocative' and 'controversial' among the words we incessantly find in too many identikit reviews.